Dependency is good, when it is interdependence. When we are connected by a need that two parties fulfill, such as in the relationship between farmer and consumer, interdependence can shine. Whether is it the government buying surplus crop from a farmer or a woman purchasing corn from a produce stand to feed her family, consumer and farmer are dependent upon each other. This links us together. In this example, we are connected by a need for nourishment and sustenance. Interdependence is a link of unending dependence. In the past several months, I’ve circled the idea of mutual dependency like a wolf circling its prey. It was both intriguing and confusing to me. It was intriguing because I didn’t actively embrace mutual reliances. (Yes, this is foolish.) It is not necessarily that I shun being dependent upon others, but my off-handed reaction was driven more by an uneducated indifference and a lack of awareness. My confusion was driven by its application in some meditation traditions. When I think of dependency, my mind immediately bounces as quickly as a tennis ball bounces off of a racquet to codependency. Without skipping a beat, emotionally I begin to back away. So, I had to put in the time to retrain my mind that dependency can be something that is to be welcomed. Now, I understand the vibe of mutual reliance can be virtuous. Going forward, I hope that I think more often of the farmer’s hands who planted all of the root vegetables in the soup my husband and I enjoy. Hands stained black with dirt and hard work as I saw at a dinner I recently attended honoring food and cooking. Or, I hope I remember that my favorite plant in the front yard was started by Rick in his nursery. Had he not started the plant from seed, I would not be able to enjoy looking at it everyday. So, when is dependency good? It is good when a link of unending dependence answers mutual needs. If you are interested in reading more about this topic, as a starting point I suggest visiting The Interdependence Project at theidproject.org. I keep coming back to this soup. I’ve made it at least twice in the past week. I’ve eaten it for dinner and lunch. While it is not pretty or fancy, it is just the sort of thing I crave in a soup. Tender, chunky vegetables that have retained a bit of bite. A good dose of onion, lots of beans, a grain, and a little bit of seasoning to pull it all together. In a medium saucepan, cook 1 c. brown rice according to package directions. Set aside. In a large stockpot or dutch oven, heat 1 – 2 T. extra virgin olive oil over medium heat. Add the diced carrots and parsnips with a pinch of salt. Cook the vegetables, stirring frequently as they begin to soften, about 8 or so minutes. Add the onion and continue to cook over medium heat about another 8 minutes, reducing the heat if necessary. When the vegetables are fork tender and the onion has become translucent, push the veg to the side and add 2 or 3 T. of tomato paste. Stir continuously as the paste loses its raw flavor, about 1 – 2 minutes. Add the spices. Stir continuously about 1 – 2 minutes to bloom the spices. Add 3 c. of broth, half of each dish of drained and rinsed beans, and half of the rice. Stir to combine. Now add the remaining broth, rice, and beans to your liking. Substitute 1 c. water for broth, if desired. (I ended up using about 2/3 of each can of beans, 2 1/2 c. of broth, 1c. of water, and 2 1/2 c. of the cooked rice.) Simmer for 5 or so minutes until the flavors begin to come together. Serve hot. Dress each bowl of soup with a drizzle of extra virgin olive oil, if desired. The past few months, I’ve been battling life’s busyness. It hasn’t been because the holiday season is in full swing with New Year’s right around the corner, although that is a contributor. Rather, it has been the everyday things that come up. Install new dishwasher. Check. Wipe up the sticky stuff off the floor in front of the kitchen sink. Check. Plant 60 feet of new hedge in the backyard so Ollie, our labradoodle, is no longer able to escape under the fence. Can’t put a checkmark on that one yet. I did put in the hedge. He is still getting out. Negotiate and purchase a new car. Check. Make Soup. Check. Our labradoodle’s latest adventure is escaping from the backyard by flattening himself like a pancake and squeezing out underneath the fence all of which he can do in under three seconds. The fence being the new, taller fence that we installed so that he would not be able to jump over it. Well, he is no longer jumping over it. Similarly, don’t we neuter our lives when we engage in much of life’s busyness? Don’t we hamper and shortchange ourselves directing our time, energy and attention to things that may very well be left undone? Are we not depriving ourselves of our personal vigor and force when we engage in busyness? When I ask myself questions such as those put forth above, my answer is “yes” to each. There are many times in my life when I wish I could answer each of those questions with a resounding, “no.” Why? Because in many ways it is easier to keep busy. We avoid things by keeping busy. That is one reason I prefer to keep myself occupied. I can avoid my fears. If I am engaged in doing something, I don’t have to face my fears. Does it help? Does that deal with the issue or the fear? No. At least not for me anyway. Avoidance aside, to my mind the real risk of constant busyness is that it pulls us away from being in the present moment. It leads us into the future by way of achievement and accomplishment, but it isn’t centering and grounding. We may cross off items 1 – 5 on our list … but where does that leave us? Really. It leaves us with items 1 – 5 crossed off the list. Maybe we feel a bit relieved temporarily once those items are checked. But, does it leave us better off? Does it leave us centered and grounded as experiencing the present moment can? Being in the present moment can come about by doing something that calms your mind and focuses attention. One way in which to do this is to orient yourself to the space and time you currently occupy. Become aware of the space on your left side, right side, in front and behind you, underneath you. Become aware of the air around you. By becoming oriented to the time and space which we currently occupy, time’s significance is modified. Our experience of time and our relationship to it changes. The things we thought were so important to accomplish? Maybe we’ll find they are no longer significant. Maybe we’ll find ourselves being less busy. Here is the final kicker. If we are truly engaged in the present moment, we are not thinking about the past or the future. Our mind becomes freer. It becomes less encumbered with fear. This New Year will find me becoming more aware of and developing a better understanding of my reasons for engaging in busyness. Might I slip? Might I need to remind myself of those things I want in my life and those things I really don’t need? Absolutely. I’ll slip and fall. And, happily do it all over again. What am I going to do with Ollie and the escaping issue? I have a few other tricks up my sleeve. After laying landscape timbers along the fence line that function as kind of an outdoor baseboard for the bottom of the fence, I bought a hybrid bike. Once I buy a bike attachment for his harness that will keep both of us safe, I can ride with him while he runs. That will accomplish fulfilling one of his needs (lots of exercise) in turn maybe lessening his desire to find adventure on the other side of the fence. Maybe we too can find fulfillment in becoming a little more engaged in the present moment, thereby lessening our need to be busy. 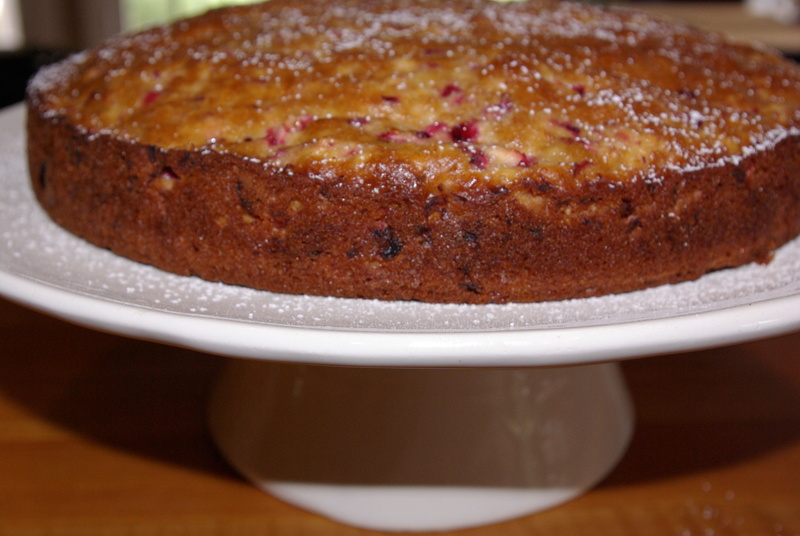 Cranberry Spice Cake was on board to be the recipe du jour, adapted from Bon Appétit. It is a pretty, festive cake. 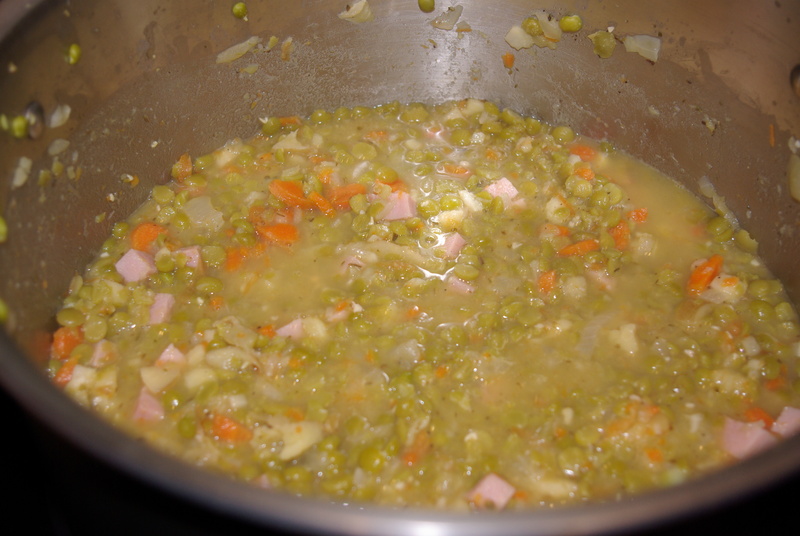 But on the same day I made the cake, I also made Split Pea Soup. The nutritional qualities of dried legumes combined with the relative ease of making soup with split peas because they do not need to be soaked, equals a need for me to share this. I am bowled over by split pea’s nutritional content. A one cup serving of split peas provide 14 grams each of fiber and protein along with many trace minerals. That is tough to beat. When I want to bake something sweet, I look for what I think of as the everydayness in a recipe. When I want to make soup, I think of what I have in the refrigerator. I already had on hand, as I typically do, onions and carrots. Parsnips I had purchased to roast. A bag of split peas was in the pantry. Cooks Notes: The split peas will have a bite to them after cooking. 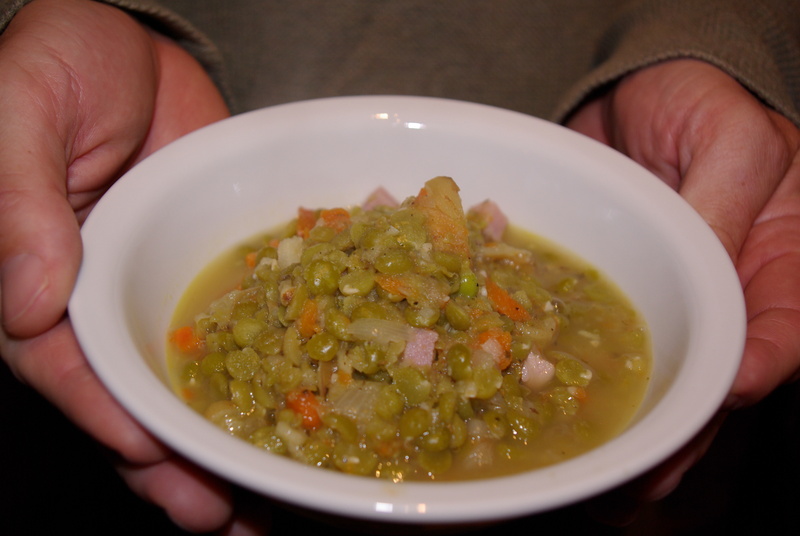 The consistency is not similar to canned split pea soups. 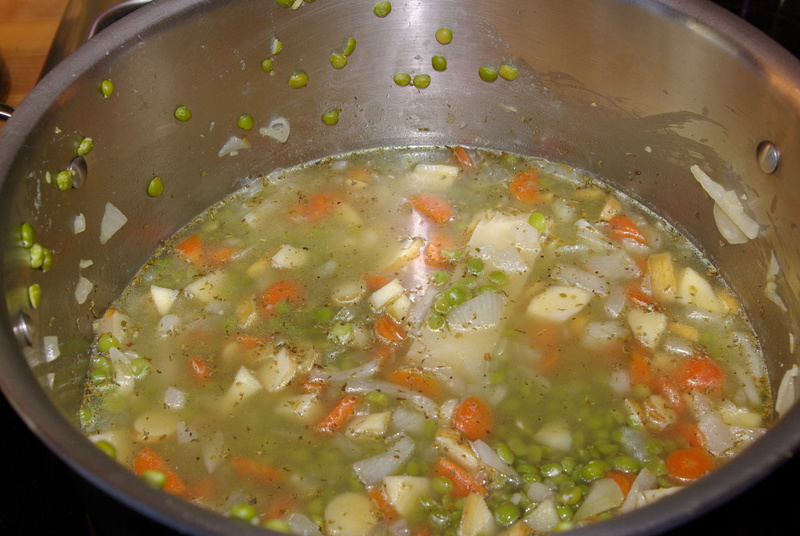 By blending or mashing the contents of the soup, the end result is a thicker, creamier soup. The parsnips add a hint of sweetness. I had less than 1/2 of a ham steak on hand. I added it, diced, at the end. In a mesh colander, rinse split peas removing any debris, set aside. In a dutch oven or large saucepan, warm over medium heat 3 T. extra virgin olive oil. Saute onion, carrot and parsnips over medium, medium high heat with a generous pinch of salt and black pepper until the vegetables have softened, approximately 10 – 15 minutes taking care to reduce heat if vegetables are browning too much. Add garlic. Stir 30 – 60 seconds until garlic is fragrant. Add the peas and 6 c. of broth. Bring to a gentle boil. Reduce heat and simmer about 45 minutes skimming off foam. Add remainder of broth to desired consistency. Simmer another 45 minutes until peas are al dente. With either a hand held masher or an immersion blender, mash or blend peas and vegetables until roughly 1/2 of peas and veg are blended. Add ham if desired. Stir and warm through. Adjust seasonings. Serve hot with a drizzle of olive oil, if desired. I can become emotional and disorganized in the face of making big decisions. Along with these attractive traits, once in awhile I’ll thrown in being ornery, more easily frustrated and irritable. If there is a full moon, watch out. I probably don’t have to tell you it is all on the north side of slightly unbecoming. Not pretty, I know. I have been kicking around the idea of returning to graduate school; hence, the conflicting thoughts in my mind. Two or more opposing thoughts in the mind create conflict. I find it best to have at least four to six. Cognitive dissonance and I are old friends. We are on a first name basis. I do suppose that I could approach the process in a more logical manner. Step 1. Sit for GREs. Step 2. Wait for score. Step 3. Determine if score will get me into a graduate school. Step 4. I won’t bore you anymore. You get the picture. But, oh no, I don’t handle it the logical way. At least not at first. I have to begin the process by imagining things like leaving my family to attend school; or, once again, paying back a mountain of debt acquired during one’s education. I handle it the emotional way. To me, summer soup (my take on minestrone soup) is a far cry from the messiness of opposing thoughts and decisions. It is a no muss, no fuss, straightforward dish. 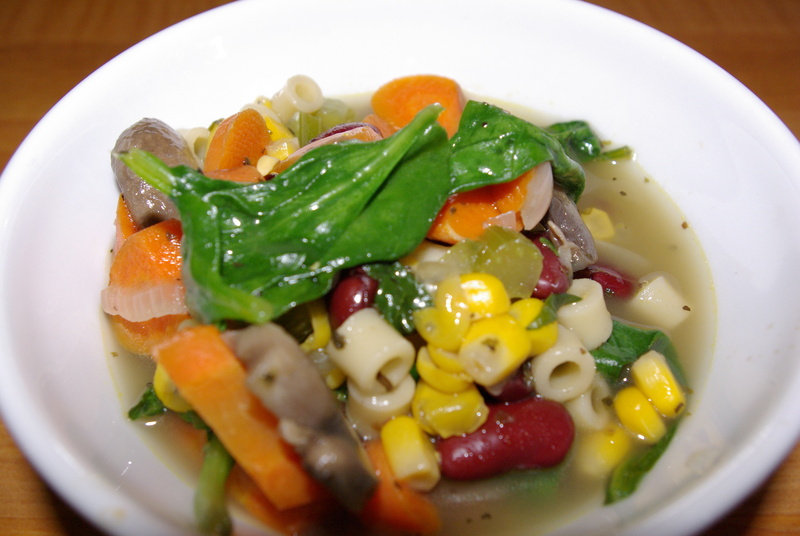 I enjoy making this soup in the summer months because it is good served at room temperature. The flavors seem to meld and heighten a bit more when the soup is allowed to rest after cooking. Full of vegetables and beans, a healthier dish is hard to find. It is also a forgiving soup. Use what you have in your vegetable drawer. Zucchini instead of carrots ? Great. Cabbage instead of spinach ? All the better. Leftover rice in the frig? Put it in your soup and leave out the ditalini. 1. In a large stock pot or dutch oven, heat 2 T. or so of olive oil over medium heat. 2. 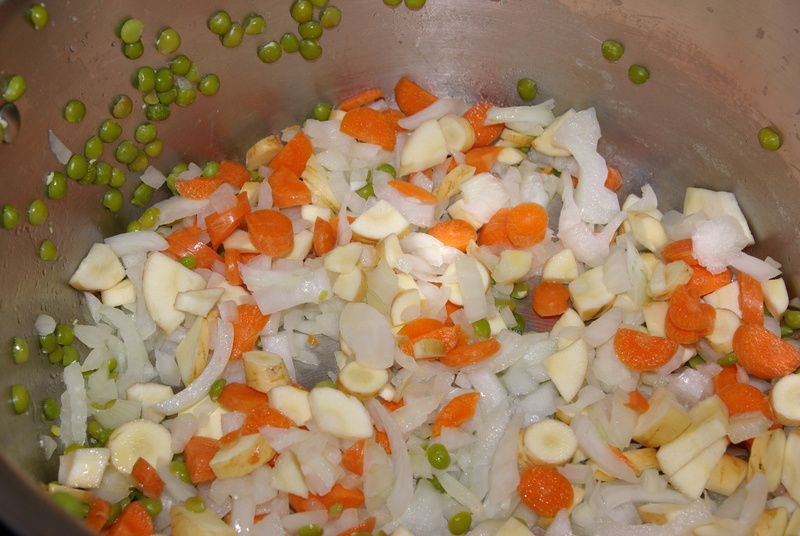 Once the oil is fragrant, add the diced onion, carrot and celery. Add a pinch of salt. Sweat vegetables until they have softened and begin to turn slightly translucent. About 10 minutes. 3. Add mushrooms and pinch of salt. Sweat mushrooms until they begin to give up their moisture and develop a slight golden brown color. About 5 minutes. 4. Add seasonings including freshly ground black pepper to taste. Stir to incorporate. 5. Add kidney beans, corn, 3 c. of the broth and ditalini. Simmer 10 minutes until pasta is al dente. Do not overcook. 6. Add remaining stock and spinach. Stir to incorporate. Put lid on pot and remove from heat allowing the heat from the dish to cook and wilt the spinach. Check after 5 – 10 minutes. Once spinach is wilted, remove lid, serve immediately or at room temperature with a drizzle of extra virgin olive oil dressing each bowl. Yes, the date in the top right hand corner is off by a year for this post. (Sweet Rusticity is as well. ) It should be October of 2010. (I fixed it! And, if you are wondering, it did take me almost a year to fix it. I pulled it off a couple months shy of October, imagine that.) If my track record says anything with gadgetry such as establishing a blog, it will take me a year to figure out how to correct it; and, by that time it will be October 2011. That aside, there is good soup below. It is a wonderful thing when the most humble of ingredients come together to form a meal. Beans and cabbage, humility experienced through food. Cabbage with its cancer-fighting compounds, is part of the cruciferous family. Green or savoy pairs well with cannelini beans adding body and substance to the soup. The flavor is heightened in this dish with ham and ground thyme. Cooks Note: Ham steaks, such as Cumberland Gap brand, can usually be found packaged in 8 oz. sizes. I serve this soup with a good quality bakery bread and extra virgin olive oil for a complete meal. Yields 4 – 6 servings. In a large soup pot or dutch oven, over medium high heat warm 3 T. or so of extra virgin olive oil. Once the oil is heated, sauté the onion with a big pinch of salt until it begins to turn translucent, about 5 – 7 minutes. Add the sliced mushrooms. Sauté the mushrooms about 5 minutes until they begin to lose moisture and soften. Adjusting the heat as necessary to avoid burning the vegetables. Once the meat has been warmed through, add the cabbage, thyme and freshly ground black pepper to taste. Cook, stirring frequently, until the cabbage begins to wilt. Add the beans and 4 cups of broth or more to desired consistency. Simmer 20 – 30 minutes. Serve with a good drizzle of extra virgin olive oil over each serving, if desired.